To commemorate International Women’s Day, a group of 6 YL colleagues met last March 8 at the club’s shack to contact radio amateurs in the 40-meter band and through the VHF repeater of OA4O. Eleana OA4DNV, Moraima OA4DTY, Olena OA4DUB, Tatiana OA4DUD, Alina OA4DUI and Sonia OA4DEM, cheered up the frequency, making QSOs with Mexico, Ecuador, Argentina, Chile and, naturally, with OA colleagues. Some of them were newbies on the air, using their callsigns for the first time, being happy and nervous at the same time, which showed in the QSOs where they participated. 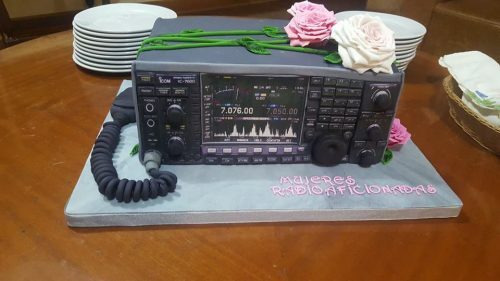 The activity was held from 19:30 to after 21:30 hours, ending with the cutting of a delicious cake that was shaped as an ICOM radio. We hope that this event is held every year and that we have our YL colleagues operating periodically from RCP.